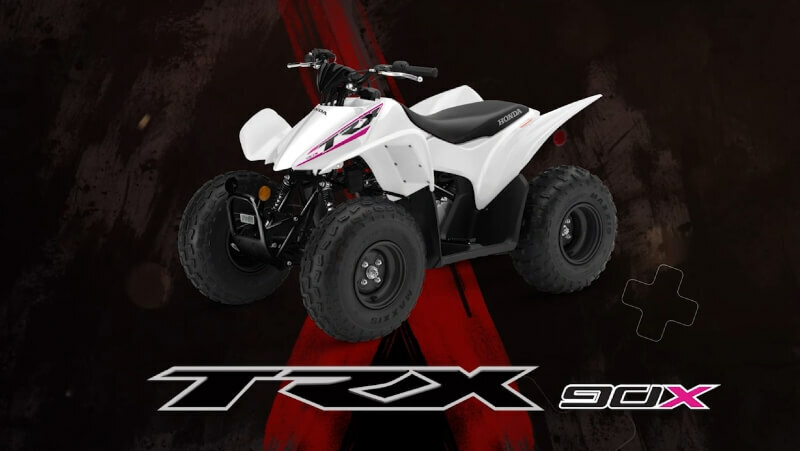 Looking for the latest in 2019 ATVs? Want to know all of the nitty-gritty specs, horsepower & torque performance figures, MSRP prices, model comparisons etc? You’ve found the right place! 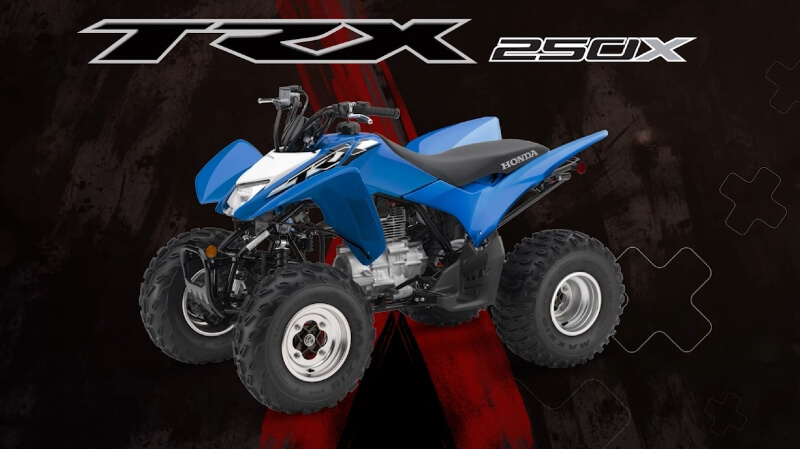 Below I break down each of the Honda FourTrax four-wheeler models in individual reviews including everything from the smallest TRX90X kids model up to the biggest ATV model that Honda offers – the Rincon 680 and everything in between like the Recon 250, Rancher 420, Foreman 500 and Rubicon 500 models. 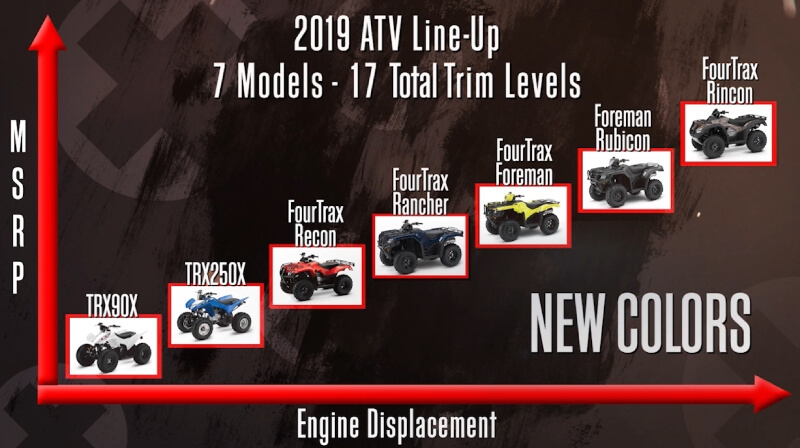 Keep an eye on this page for individual 2019 ATV model reviews just like I did on the 2018 ATV model lineup that you can find here. I’ll be breaking down detailed horsepower and torque performance numbers, pricing, R&D info and loads more and they will be finished up shortly. April 23, 2018 Update: Today, I’m releasing my 2nd 2019 Honda ATV Model Lineup Announcement Update and you can check it out by Clicking Below. 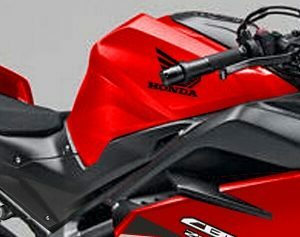 UPDATE 5/15: 2019 Honda ATV Model Lineup Announcement #1 – CLICK HERE! Now we’ll get to a breakdown of each of the 2019 Honda ATV models covering their release dates, new color options etc. 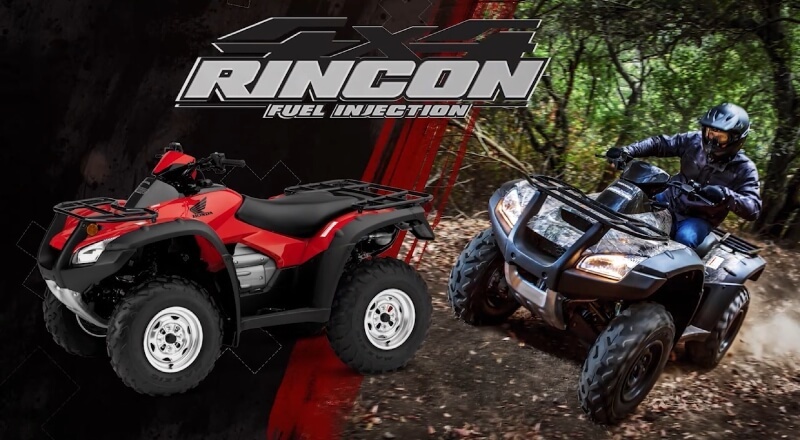 This page will be updated on 5/23/2018 with the rest of the 2019 Honda ATV model lineup including the 2019 Rancher 420 4×4, 2019 Foreman 500 4×4, 2019 Rubicon 500 4×4, 2019 Rincon 680 4×4, 2019 TRX250X and TRX90X sport quad models. 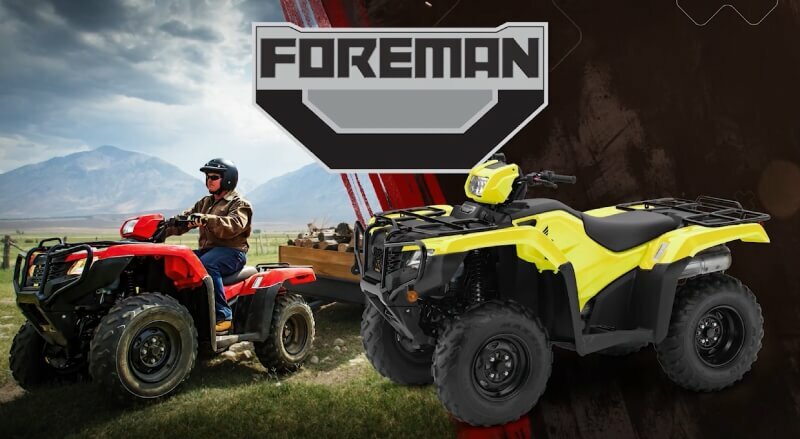 In an age of increasing specialization, versatility can be extremely refreshing, and it’s difficult to find a better example of do-it-all effectiveness than Honda’s family of capable Rancher ATVs. 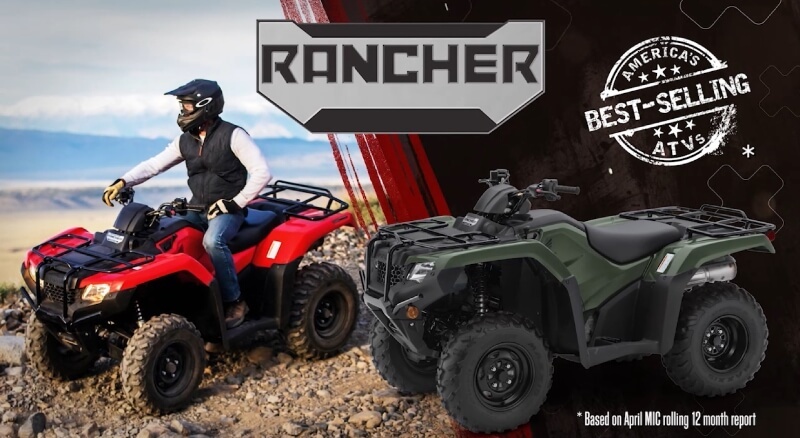 With incredible versatility and value, the Rancher has been a strong performer since its 2000 introduction, helping it to become Honda’s best-selling ATV in Honda’s history. No matter what the application—whether it’s accessing a favorite deer stand, repairing a fence on the back 40, or just exploring the local OHV area with friends—there’s a Rancher that’s ideally suited. The current version is the best ever, enabling customers to choose between (6) difference model configurations: Independent Rear Suspension (IRS) or swingarm, Automatic Dual Clutch Transmission (DCT) or standard gearbox, Electric Power Steering (EPS) and standard, and 4×4 or two-wheel drive. No matter what the options, Ranchers are renowned for their durability, and they’re equally capable at the jobsite and on the trail. 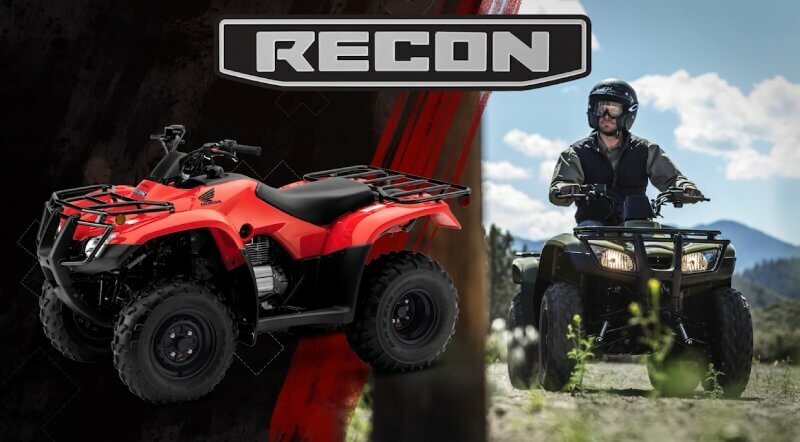 The 420cc liquid-cooled single-cylinder engine offers the sort of unrivaled reliability that keeps Rancher owners using their vehicles for many years, and appropriately, the spread of power is well suited for any situation. 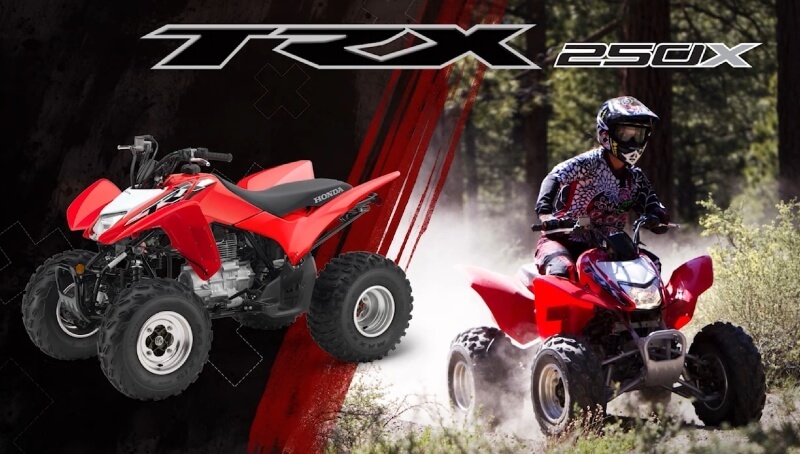 The 2019 Honda TRX90X returns unchanged for 2019. Without a doubt, Honda’s proven TRX90X is one of the best first steps that a young rider can take on the journey toward a lifetime of off-road recreation. This air-cooled four-stroke has all the right ingredients to be the ultimate first machine: electric starting, manageable power, consistent handling, compliant suspension, and uncomplicated controls. The TRX90X used to be recommended for kids 12 and older but that age has now been dropped to being recommended for kids 10 and up.